ASLogger call recorder software has the ability to record analog, proprietary digital PBX, T1/E1, ISDN, PRI, BRI, and VoIP lines. In this digital world of communication where technology is being changed and work habits are increasing the mobility of workers. Call recording is gaining in importance to use in training; auditing and compliance that can also play a vital role in planning for business continuity. Call recording software is facing a growing demand in the market and a number of financial regulators are recommending its implementation. Ahmad Software Technologies is proud to launch express edition of its most demanding Call Recording Software (ASLogger) for individuals to organization level users. The idea behind is to provide this highly technical solution to those who cannot afford costly solution and who really needs Call Recoding for gratifying their business. Express Edition is totally free with optional service charges. With our express edition you can enjoy all the features of our enterprise leveledition with few limitations. Integrated Recorder: Integrated Recording Server for Analog, Digital, VoIP, ISDN, E1/T1 Lines. What can you do with live calls? On the spot add call tagging, call rating, bookmarks, and comments e.g. account # using telephone keypad. Recording Options: Automatic call recording / Record on demand. Recording Space: 174 hours calls take only 1 GB space. Security: Secure Call Recording format with optional layer of encryption. No other software can read the data. 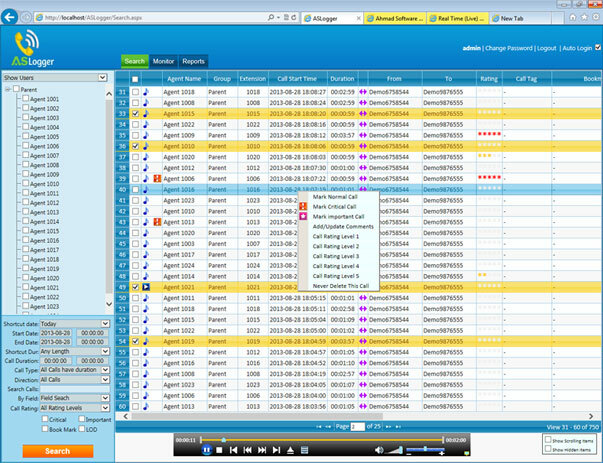 Web based Solution: Browser based solution to access recordings, live calls and reports. Searching: Quickly search and Playback required calls and export it for standard players. Listen Live Calls: Listen live Calls for monitoring. Multi-play: Multi-play Live calls and playback multiple recorded calls simultaneously. Playback Speed: Variable speed constant pitch. Email Recording, Silence on Demand. Call Direction (Incoming / Outgoing). Agent's Evaluations: Agent Evaluation enables you to quickly assess how well your employees are performing. Reporting: Custom Reports with tabular, graphical forms. Export Reports in excel, PDF, Word formats. User Rights: Custom User access rights management and permissions. Backup: Auto Archive Recordings for Virtually Unlimited Storage. Agent's screen capturing module and FTP server for screen capturing. Disaster management and recovery module. ASLogger Call Recording is just one page installer that is quick and easy. You can also take remote Installation and Configuration services in just $100 USD. Subscribe for annual support and maintenance in $100 USD.